The latest industry figures show that women are the fastest growing segment of the sport. There are now over 4.5 million women motorcycle riders, and that one out of every three riders enrolling in motorcycle training classes is a woman. I’ve had motorcycle industry executives downplay the role of women in motorcycling during their conversations with me, which seems not only foolish but self-defeating. After all, it’s supposed to be all about money for them, isn’t it? But at least one company has seen the light — and the dollar signs — and has made a serious investment in a line of motorcycle clothing designed specifically for women. More on that in a second, but first I have one more complaint. Visit just about any online retailer of motorcycle clothing, and chances are you will not find a women’s section. You’d be lucky to find any women’s clothing at all, and if you do, it will probably be some unisex sized item that is otherwise indistinguishable from the man’s version. That’s why I say “bravo” to Hein Gericke and Fairchild Sports for investing in us. I think this is a big deal — a major international motorcycle clothing manufacturer has a strategy and has invested serious capital in developing, designing, marketing and selling a line of motorcycle clothing designed by women for women. And the part I like best is this: “The fit of the garments is geared for real women with real curves, not runway models”. Their words, not mine! After all, when’s the last time you saw a real live female with a body like Kate Moss? 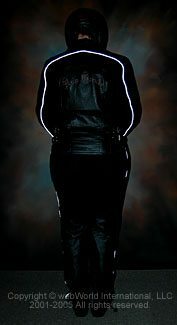 The rest of us need high quality, protective motorcycle clothing that looks good, that fits real women and that makes us feel good when we wear it. The G-Line Doheny jacket and pants certainly do that. As soon as I opened the box I could tell that these garments were positively different than anything else I’ve seen. I think that both the attention to detail and the quality, which are both excellent really make the difference. There are so many nice features that it’s hard to know where to start! But the best part about it is that the Doheny jacket and pants are very flattering to the figure. This isn’t easy to do, but I think it’s basically a result of the unique design, because they used a very clever trick on the front and back of the jacket to make it look slimmer and fit better. What’s the secret? The front and back of the jacket and the outer portion of the sleeves are made from leather. The leather is designed into panels that form the front and the back of the jacket. These panels are slightly tapered from the top to the waist to give the jacket — and the wearer — a smoother and slimmer look. And there’s a bonus: hidden under the outer edges of the panel on either side are zippers for air vents! The zippers open to 9″ long, and they are backed up by a mesh section that is cut out of the jacket liner to allow the air to flow through the liner. The liner is not removable and is a thin quilt that feels comfortable next to your skin. The matching leather panel on the back of the jacket has matching air vents on either side, also backed with mesh panels inside to allow the air to flow out. The back of the jacket also has a very beautifully embroidered “Hein Gericke” script in a muted gray color that suits the styling. The seam that runs up from the arms and across the back is made with reflective piping (photo left), which helps to make you more visible at night. The piping is matched on the pants, and sections of it can be seen in the photo. The non-leather parts of the jacket are made from water-resistant Nylon, which helps to keep the jacket light in weight. The leather and the Nylon are not the super heavyweight racing leather thickness, so I guess I can classify both of these garments as lightweight touring grade. But the leather is soft and very flexible, like something you’d find in a dress jacket. Both the jacket and the pants are styled with what I will call a “modern, sophisticated look with overtones of 1950’s rebel”. The double waist belts that have antiqued silver buckles and that serve to cinch up the jacket at the waist are what give it the touch of rebelliousness. I’m not really a “black leather and lace” person, but the Doheny has a nice blend of styles that I think will bridge a wide variety of tastes. The Doheny jacket has removable soft padding in the elbows and back. Hein Gericke says that the armor in the Doheny is their CE-approved Hiprotec brand. It’s fairly thin, and I guess this is one area where style takes preference over protection, a tradeoff. But since all of the pieces are removable, it should be fairly easy to replace them with more robust types. Although doing so will probably alter the way the garments drape over your body. The jacket has a zippered pocket inside on the left and a patch pocket on the inside on the right. It also has two zipper closing hand warmer pockets. The zipper pulls are made from shiny metal and they help offset the black leather. 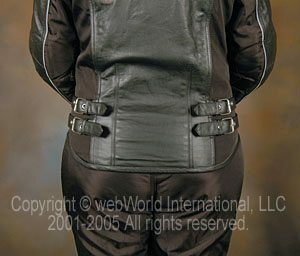 The jacket’s arm cuffs close with a zipper and a metal snap. And last but not least, my favorite feature: Each shoulder has a vestigial epaulet sewn on to the top. The left one has a chrome plated, metal stylized “G” logo hanging from the end, and it has a tiny faux diamond embedded in it. The logo is a nice small and elegant styling touch. It’s matched by the same “G” logo hanging from the waistband of the pants, which also have a few very discreet “G” chrome logos on the front. By the way, the jacket also has a light gray reflective “tribal” graphic printed on the lower arms, which adds to the rebel look but these are very tasteful and contribute to the overall nice styling. I take a size 12 jacket, and the size 12 Doheny jacket fits me perfectly. I have received several compliments on the looks of this jacket from both men and women! It’s very stylish and I think is a perfect example of a woman’s motorcycle garment designed for and by women! The G-Line Doheny pants are a perfect match for the jacket. The pants do not attach to the jacket, but they have their own belt loop in the Nylon waist. The waist rise is slightly low, and the back waistband of the pants fit slightly loose on my figure, but a belt solves this problem. The front of the pants have a nice feature that serves two purposes. The front of the pants have two open horizontal pockets between the leather and the Nylon fabric that forms the upper thigh. These pockets are shaped so that the front of the pants is reminiscent of a pair of chaps. The lower portion of the legs in front and back are the same soft leather that is present in the Doheny jacket. The pants have sections of thin padding on each hip, and these can also be removed and potentially replaced with thicker versions. The pants are lined with a mesh fabric down to the knees, and from the knees down to the cuffs the pants are lined with a soft fleece material. The pants close with a zipper and snap button. Since the Doheny pants are designed to be worn over shoes or boots, the cuffs are not tapered. There is a stretchy adjustment loop at the cuff though, although I’m not very fond of the spring-loaded adjustment device that hangs down from each cuff. I wear the pants with my Specter Road leather boots, which fit the styling perfectly and make a really nice riding outfit with the Doheny jacket..
Also, the pants carry through the reflective piping found in the Doheny jacket. The piping on the pants runs down the outer seam of each leg. I normally take a size 12 pants, but it seems that the Doheny pants run about two sizes small, so I had to go with a size 16 to fit me. I’m very impressed with the entire G-line approach, and the Doheny jacket and pants are perfect. They are very nicely styled and tailored and although they probably don’t offer the same protection as a set of racing leathers, they sure look better! Product Comments: Sizes available – Jacket: 4 – 18; Pants: 4 – 16. Pants seem to run two sizes smaller than labeled; i.e., a size 16 is actually a 12. Hein Gericke offers a 10 year warranty for leather and two years for textiles; since the Doheny is a combination of leather and textile, it’s not clear how long the warranty will be in effect. A portion of the proceeds from all G-Line clothing are donated to fight breast cancer.